We bring you another summary of an [art]attack show by ChooChooTV, this one profiling C&G Artpartment, founded by Clara Cheung, who studied art in the United States for four years, and Cheng Yee Man (Gum), an HKAPA and RMIT graduate. Artpartment is a gallery and studio space in Hong Kong dedicated to the production and exhibition of experimental art. Artists Clara Cheung and Cheng Yee Man (Gum) discuss their Hong Kong studio and gallery C&G Artpartment on ChooChooTV. The video focuses on art created by the pair for the stop motion art group exhibition, “No Money for Art vs. No Time for Art”, held at Artpartment. They use video, drawing and painting to create videos expressing the social aspirations behind their work. Both artists have strong views about the job of an artist and these are expressed in the video. Tyler Rollins Fine Art has announced its 2010-2011 exhibition schedule. The gallery will present solo exhibitions by four of the most highly respected artists from the Southeast Asian region starting from 16 September, this year. Tyler Rollins Fine Art is a gallery in New York’s Chelsea area that has a primary focus on contemporary Southeast Asian art; one of the art world’s most culturally diverse and dynamic areas. As the gallery says, its objective is to put the spotlight on some of the most exciting trends in contemporary art, drawing attention to the interconnectedness of today’s globalised art world and fostering inter-cultural dialogue between the East and West. The gallery will first show the Filipino artist, Manuel Ocampo, the most internationally-know contemporary artist from the Philippines. Ocampo has been a vital presence on the international art scene for over twenty years and is known for fearlessly tackling the taboos and cherished icons of society and of the art world itself. Marking his sixtieth solo show, Ocampo will be presenting new paintings and woodcut panels featuring traditional Christian iconography combined with secular and political narratives. Following Ocampo, is Vietnam’s most prominent female contemporary artist, Tiffany Chung. Chung, noted for her sculptures, videos, photographs and performance work, will showcase her works at Tyler Rollins from 14 November to 31 December this year. Inspired by maps of urban regions, Chung’s solo show at the gallery explores the topographic after-images of some of the past century’s most traumatic conflicts. 'Berlin Wall', 2010, embroidery, painted metal grommets, and buttons on canvas. The maps that Chung is showcasing tell us about our relations with the past and our visions of the future. Image courtesy of Tyler Rollins Fine Art. Moving away from Southeast Asian art, Tyler Rollins Fine Art will also present works by Tracey Moffatt, an Australian artist who is one of today’s leading international visual artists working in photography, film and video. Many of her photographs and short films have achieved iconic status around the world; Moffatt takes her inspiration as much from popular culture and the idea of fame and celebrity as she does from art history. In January 2011, Tyler Rollins will be featuring her recent photographic series, Plantation, as well as Other, the final work in her video series inspired by Hollywood films. 'Plantation (Diptych No. 1)', 2009, digital print with archival pigments. 'InkAid', watercolor paint and archival glue on handmade Chautara Lokta paper. Tracey Moffatt's eerie pictures delve into a troubled history of exploitation. The man in the image is an alien, an outsider who is not welcomed into the colonial-style house. Image courtesy of Tyler Rollins Fine Art. As a finale to this artist line-up, Tyler Rollins will be presenting Agus Suwage from March to April, 2011. 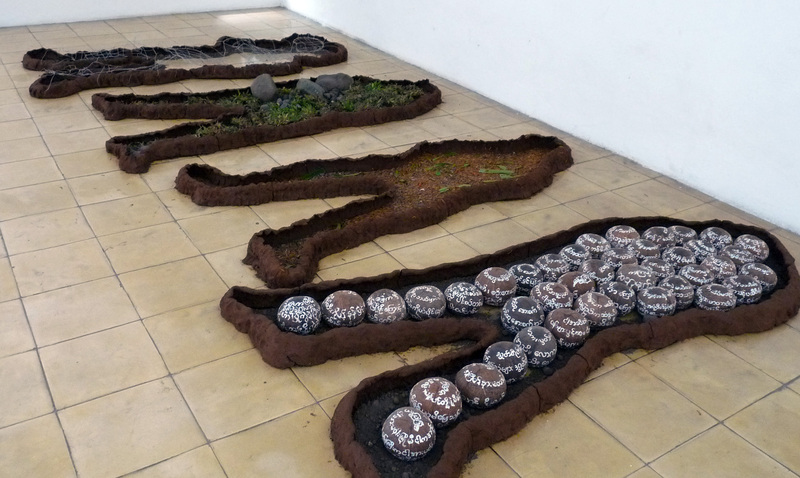 Suwage is often named as one of the most important Indonesian contemporary artists. Although little of his work has been seen in the U.S., it has been exhibited around the world over the past few decades and is included in most major collections and surveys of Indonesian contemporary art. Suwage's paintings explore the predominant theme of the self-portrait, employing the artist’s own body and face in a number of guises to address questions of identity and change in his surrounding socio-cultural condition. 'Playing the Fool' (2004) is the artist’s continuing exploration into violence, pain and joy. Image courtesy of Tyler Rollins Fine Art. Liu Shih-tung is a Taiwanese mixed media artist, born in 1970 in central Taiwan’s Miaoli County. He has been a practicing artist since 1985 when he entered the newly established senior high school art major classes and has been working primarily with collage since the early 2000s. From July to August this year, Liu undertook a residency at 18th Street Art Center in Los Angeles, California and we talk to him about this experience. Liu Shih-tung's 2010 work on exhibition at Page Museum, Los Angeles. Image courtesy of the artist. By the time Liu had graduated from college and completed his compulsory military service it was the early 1990s. Installation and performance art were popular mediums of expression in Taiwan at this time, perhaps because the country had recently broken from decades of authoritarian rule. In 1997 and 1998 Liu took part in two environmental art projects, River, sponsored by the Taipei Country government’s Cultural Affairs Bureau and Land Ethics, sponsored by the Fubon Art Foundation. In 2001, during an artist residency at South Korea’s Younge-Un Museum of Contemporary Art, the artist created an indoor performance sequel to work done in Land Ethics, called Regeneration II. In the same year the Taipei Fine Arts Museum exhibited one of his installation pieces, Neon Light, Flash, Flash, Flash. Liu Shih-tung has undertaken artist residencies in New York, Korea and Los Angeles. Since the early 1990s, he has held solo and been involved in group exhibitions throughout Taiwan and his works have been collected by the National Taiwan Museum of Fine Arts. New work created by Liu Shih-tung during his 2010 18th Street Art Center residency. Image courtesy of the artist. How did 18th Street Art Centre support you during your residency with them? They provided me with a great studio and organised an open studio event twice, one on 10 July and another on 7 August this year. Many artists and members of the public came during the open studio. By having these people view my creations and works, this achieved the purpose of a cultural exchange. Why do you think you were selected for the 18th Street artist residency? 18th Street was my first choice because I wanted to understand more about modern art development on the West Coast of the US. How has the 18th Street artist residency helped your art? During this residency I mainly wanted to work on 2D creation, making collage using materials from LA (Los Angeles). 18th Street provides us with a lot of magazines and books, as well as information on how to purchase art materials. What was the most important thing you will take from the residency? Why? I think when you’re in a foreign land you discover cultural differences in easier and more leisurely ways. My greatest gains have been the experiences I have taken from LA life and culture: visiting all the art galleries and museums and discussing art with other artists at 18th Street. Their points of view assisted me in discovering the spirit which American culture is pursuing and the development of its art environment. Who were you most excited to meet or interact with during your residency? How did they help or inspire you in your art or your life? The people who I enjoyed meeting and interacting with the most during this residency were artists, critics, curators and art gallery dealers. However, I can’t deny that it’s not easy to gain practical benefits within such a short period of time. How is the art community in the US different from Taiwan’s art community? I think they are about the same. It’s just that those within the US art community can integrate their art into their daily life better. Is this your first international residency outside Asia? Can you briefly tell me about any others, if any? This is my third residency experience. The first one I undertook was in 1998; I recieved a New York art scholarship from the Asian Cultural Council. My second residency was at Younge-Un Museum of Contemporary Art, Korea in 2001. I believe that 18th Street, by bringing foreign resident artists to the US to participate in related art activities, achieves its purpose of cultural exchange. In an Art Radar Asia exclusive interview with Cemeti founder Nindityo Adipurnomo, we hear the fascinating story of their latest venture working collaboratively with artists from Myanmar. Read on to learn how cultural conflicts and artistic disappointments were eventually resolved. New Zero Art Space in Myanmar and Cemeti Art House in Indonesia joined hands in June this year to present the collaborative project and exhibition “+Road|5 Myanmar Artists + 5 Jogja Artists“ in Yogyakarta. 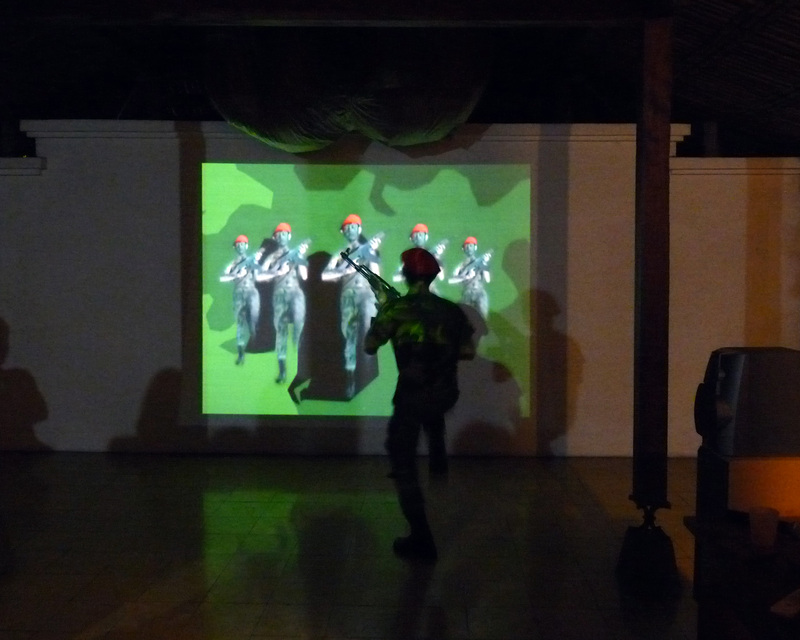 Within a tight schedule of two weeks, five Burmese artists and five Indonesian artists interacted and produced performances, videos and installations. These creations acted as a language through which the two distinctive cultures could communicate their differences, resolve conflicts and move closer to mutual understanding. The five participating Myanmar artists included Aye Ko, (Executive Director of New Zero Art Space), May Moe Thu, Htoo Aung Kyaw, Nwe (Thin Lei Nwe) and Zoncy (Zon Sapal Phyu). The five Indonesian artists were Doger Panorsa, Ikhsan Syahirul Alim (Ican), Restu Ratnaningtyas, Ristyanto Cahyo Wibowo and Wibowo Adi Utama. To understand more about how the collaborative project came into being, how the event was viewed by the local art community, and to gain some insight into the Indonesian art scene, Art Radar Asia spoke with Nindityo Adipurnomo, one of the executive directors of Cemeti Art House. +Road| 5 Myanmar Artists + 5 Jogja Artists, a collaborative exhibition currently being held at Indonesian art gallery, Cemeti Art House. Nindityo Adipurnomo explained that the idea of collaboration between the two art spaces was initiated by Aye Ko, Myanmar artist and director of New Zero Art Space and Community New Zero Art Space. Ko thought that, by hosting a project of this kind, New Zero Art Space might land an exchange grant from the Asian Cultural Council in New York. With this in mind, Ko proposed the idea to Mella Jaarsma and Nindityo Adipurnomo, co-owners/coordinators of the renowned Indonesian gallery Cemeti Art House and winners of the 2006 John D. Rockefeller 3rd Awards, who expressed a keen interest. The couple saw “+Road” as an excellent opportunity to develop networks within regions such as Myanmar. They had learnt much from New Zero Art Space and they had been seeking opportunities to cooperate with them since attending the New Zero Art Space organised 2007 ASEAN Contemporary Art Exchange Program, an event open only to members of the space. Of the programme, Adipurnomo recalled how each of the artists, gallery owners and art activists who participated had to bring along a single painting of a limited size with no political message. The night before the event, the Burmese police came and censored the art works on display, and removed the works of four Burmese artists. Despite this horrific episode, the programme was fruitful; each of the art activists present conducted informative talks. In addition, “+Road”‘s aims were in line with the project-based platform Cemeti Art House has been working under since the beginning of 2010. 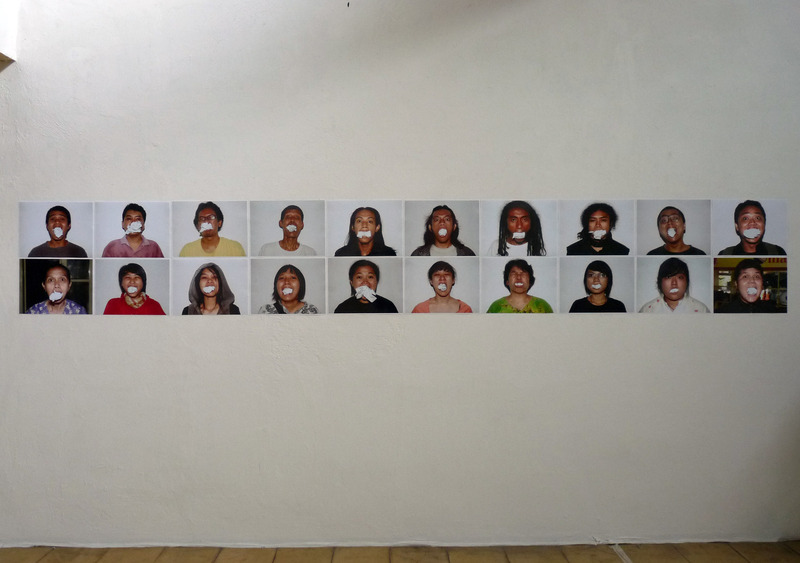 This new platform focuses on an alternative approach to art and society in Indonesia. They have a successful model to follow; Landing Soon (2006-2009) was a three year exchange program in which one Dutch artist and one Indonesian artist resided in Yogyakarta and received assistance, guidance, and support from the studio manager through weekly progress reports. However, it turned out Aye Ko wasn’t thinking about the kind of collaborative exhibition Adipurnomo had in mind. Basically, he just wanted to use Cemeti’s exhibition space for a group exhibition of five Myanmar artists and five Indonesian artists, where published catalogues could distributed. His commercial approach to the collaboration, which did not aim to provide any platform for meaningful interactions among artists, was certainly not what Cemeti Art House wanted. Jaarsma and Adipurnomo tried carefully to intervene and transform the cooperation into a “mutual exchange project” instead: a program involving short events such as artists’ talks, discussions, workshops and master classes, allowing both groups of artists to understand each other better and create possibilities for a deeper collaboration, with an exhibition as the end goal. And in Jaarsma and Adipurnomo’s eyes, it was a success. 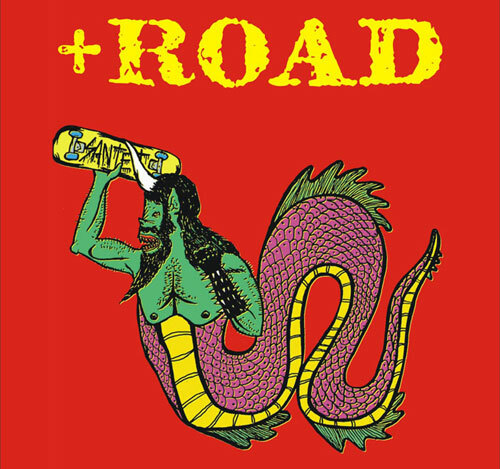 “+Road” became a truly collaborative project for the ten artists involved, where they could engage themselves in intensive cultural exchanges and meaningful interactions. 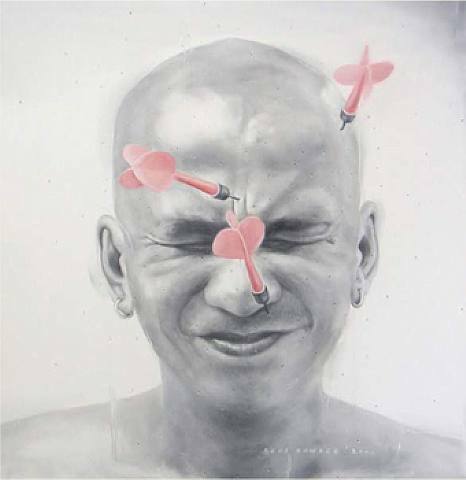 The choice of the five Burmese artists and the five Indonesian artists was made separately by New Zero Art Space and Cemeti Art House respectively. Adipurnomo launched an open application, attracting nearly seventy artists, and selected five from this group. He admits to being disappointed with the choice made by New Zero Art Space. Among the five Burmese artists, only two were professional artists, while the rest of them were new members of New Zero Art Space and were very amateur beginners. In contrast, the Yogyakarta artists selected by Cemeti Art House had a lot professional experience. Although the Burmese artists were generally inexperienced painters, their strength lay in performance art, an artistic skill which the Yogyakarta artists were either still developing or not interested in exploring. This mix of opposing artistic strengths, differences which became very apparent during the workshops, influenced what was produced for the exhibition finale. “+Road” showcased a lot of video works and photographs, and a smaller number of installation and performance pieces, with no paintings at all. Zon Sapal Phyu's 'Revolution of Own Space' (mixed media). Aye Ko's 'No Money, Hungry, Hard Eating' (photography, video). 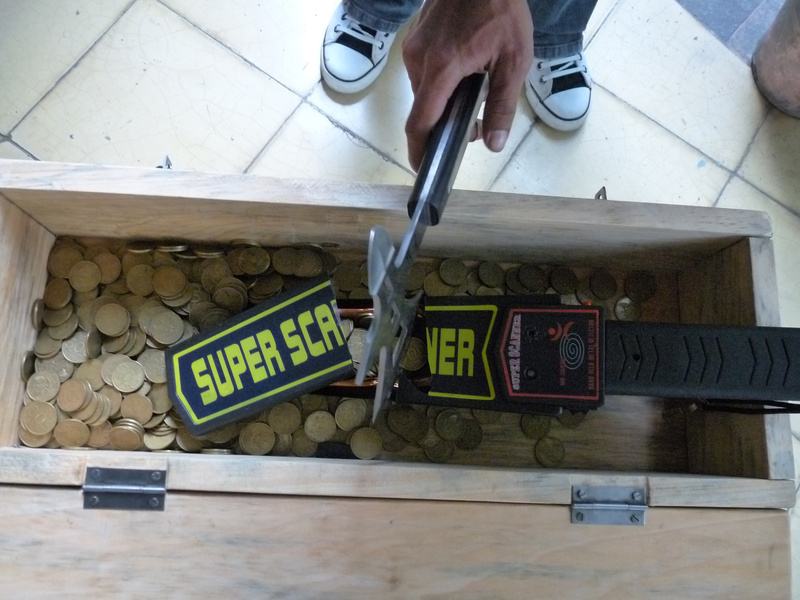 Wibowo Adi Utama's 'Art-NARCHY' (video). Ikhsan Syahirul Alim's 'Commando Dance' (video, karaoke). Overall, Cemeti Art House viewed the collaboration as a successful pilot project, achieving its aim of engaging artists from two cultures in interactions that led to a gradual mutual understanding. Adipurnomo considers Cemeti Art House to be ground-breaking in promoting a healthy regeneration of the Indonesian contemporary art scene, which has grown largely commercially up to this point. From “rumours and a very quick-glimpse analyzation and observation”, he suggests that banks have been gaining control of the Indonesian art market. With the opening of the Jogyakarta Art Fair recently, art dealers and bankers, many of whom had never visited the region before, flocked to Cemeti Art House to see what was happening. This is, perhaps, further evidence that the Indonesian arts scene is commercialising. Guest writer Bonnie E. Engel, a Hong Kong freelance journalist, presents Art Radar Asia readers with her perspective on the talks of two speakers at the this year’s Asia Art Forum, held in Hong Kong in May. Hong Kong art critic and curator Valerie Doran discusses the question, “Is Hong Kong a cultural desert?” and Indonesian private art collector Dr. Oei Hong Djien divulges his collecting secrets. Engel attended the third edition of Asia Art Forum’s three day gathering of talks and artist studio visits, designed for emerging and established collectors and presented by influential curators, collectors and experts. This year’s forum focussed on Chinese art. Read more about why organiser Pippa Dennis set up the Forum here. Art curator and critic Valerie Doran. This perception is fed by the lack of facilities in the city in which to show Hong Kong contemporary art and relatively few full-time artists who are more or less invisible unless collectors hunt them out. These artists are nourished on the peripheries of the territory, out in the new territories like Kowloon and the industrial sections of Hong Kong Island, rather than in Central or Causeway Bay. The audience was grateful to see works by the older generation of artists in Hong Kong, who seemed driven to create art without a market or venue, artists such as Luis Chan and Lui Shou-kwan, who were born at the beginning of the 20th century, and Wucius Wong, Gaylord Chang, Ha Bik Chuen and Chu Hing Wah, all born before World War II. Most of their works are small, possibly reflecting the lack of space in Hong Kong. Doran explained that Hong Kong’s art industry developed outside the concept of the art market. A lot of the art made in Hong Kong is installation (temporary) or conceptual, mainly due to a lack of space and resources, and the need for a supportive community rather than one so focused on making money. Post-war artists also failed to rise to any great heights, but after the 1989 incident artists rose to the occasion and responded by creating conceptual and performance art pieces, perhaps a pivotal moment in the development of Hong Kong art. As Doran relayed, part of the problem is the lack of governmental policy regarding artists, or rather that the official policy seems to be to ignore the arts. Recently, with the newly created West Kowloon Cultural District, built on reclaimed land, artists and curators are beginning to worry that the government will begin to establish arts policy, much to the detriment of arts development in the territory. To date, the government has sponsored performing art shows and events more substantially than the visual arts, perhaps a legacy of the culture-starved colonials from the UK before 1997. She highlighted one successful governmental project, the art space Para/Site, which receives some funding from the rather new Arts Development Council, an organisation not noted for promoting local arts or artists without a lot of red tape and many meetings. The city’s major museum, the Hong Kong Museum of Art, is closed to outside curators (unless you are Louis Vuitton or other big money sponsors), so it was unique that Doran was allowed to create the Antonio Mak show there. Although many people agree that Hong Kong needs a contemporary art museum, Doran sees more hope in the integration and cooperation of the Pearl River Delta cities, an action that could sweep Hong Kong up into the larger regional arts scene. Doran concluded by noting that Hong Kong’s artists are beginning to participate in the Venice Biennale and other internationals shows, and collectors are gathering in the territory twice a year for major auctions of Chinese and Southeast Asian art. Artists such as Kacey Wong, Lee Kit, Stanley Wong (anothermountainman), Tozer Pak, Sarah Tse, Luke Ching Chin-wai, Anthony Leung Po Shan, Chow Chun Fai, Lam Tung Pang and Warren Leung are starting to shine at local and international galleries. Valerie Doran is a critic and curator who, after spending seven years in Taiwan, is now based in Hong Kong. She specialises in contemporary Asian art with a special interest in cross-cultural currents and comparative art theory. She is a contributing editor of Orientations Magazine. Her Hong Kong curatorial projects include Simon Birch’s multi-media extravaganza, “Hope and Glory” and the controversial exhibition “Looking for Antonio Mak” which showed at the Hong Kong Museum of Art in 2008 and 2009. Art Radar Asia has published a number of articles on Valerie Doran, including this exclusive interview. Indonesian art specialist and collector Dr. Oei Hong Djien. Dr. Oei Hong Djien, the final speaker on Sunday, was born and is based in Indonesia. He has been collecting art for nearly thirty years, focusing on modern and contemporary Indonesian art. The collection comprises about 1500 works, a fraction of which is on public display in his private museum, known as the OHD museum, where he is the curator. A book about his collection by Dr. Helena Spanjaard was published in 2004: Exploring Modern Indonesian Art: The collection of Dr Oei Hong Djien. More open than most collectors, perhaps because he already has a large collection and has built a building to house it, Dr. Oei’s presentation was refreshing and candid. His “essence of collecting” vocabulary should become the bible of collectors: money, knowledge, passion, patience, courage, relation, quality, timing, luck and experience. He expanded upon these words, giving sage advice, and combined this with a showing of some of the best examples of modern Indonesian art. His insistence on courage was very telling, as he advised new collectors with limited funds to go after young artists, buy unpopular works that go against the mainstream, look up forgotten old masters and get masterpieces that include unsuitable subject matter. This advice is predicated on hard work, self-education and endless observing, reobserving and observing again, to learn what quality art is and how to buy it. Most importantly, he said not to be afraid to make mistakes because that is how a serious collector becomes better. Bonnie E. Engel has been a freelance journalist in Hong Kong for about 25 years. She is an Asian art specialist, covering all forms of visual arts. She travels around the region to visit artists, galleries, auctions and art fairs, and meets international artists when they come to Hong Kong. She has written for Hong Kong Prestige, Hong Kong Tatler, Gafenku, Muse Magazine, Asian Art Newspaper and other publications. Editorial disclaimer – The opinions and views expressed by guest writers do not necessarily reflect those of Art Radar Asia, staff, sponsors and partners.